1. ALL PURPOSE AND NATURAL: Reversible double sided with recyclable natural tree rubber and EcoPure printed microfiber. Odor free. 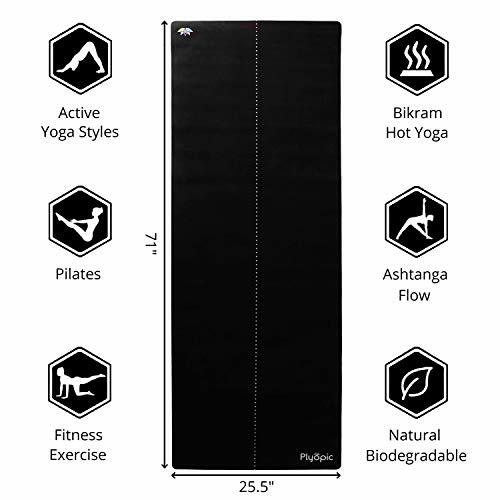 Multi Use: yoga mat, pilates mat, yoga rug, cardio mat, aerobic mat, stretching mat. 2. 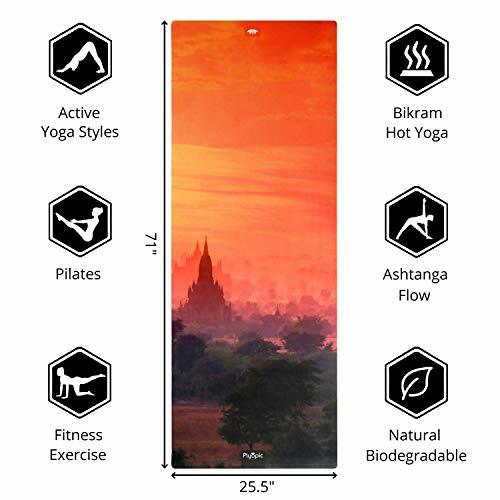 ECO-FRIENDLY: Yoga mat is healthy, non toxic and free from silicone, toxic glue, PVC, chlorine and phthalates. Water based inks. 3. 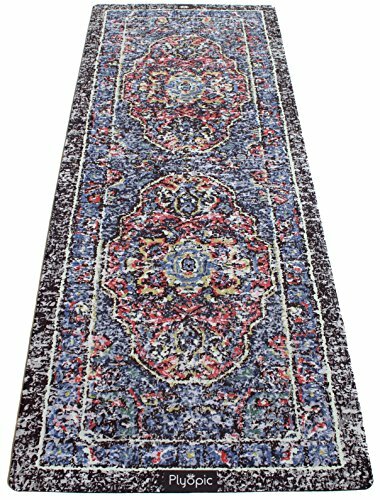 BEST DURABLE MAT: Highly resistant and durable rubber. Designer print will not fade and mat will not deform when washed. 4. STABILITY: High density 3.5mm thickness provides firm grounded support and pose stability. 5. TRACTION: Slip free natural rubber base firmly grips the floor. The mat won't curl or move during practice. 6. COMFORT: Absorbent microfiber surface is designed to grip more when you sweat. 7. SPACIOUS: Longer and wider than a regular yoga mat to give you extra space in class to comfortably execute any pose. 8. ASSISTIVE: Stay centered and symmetrical in your practice using the center line markings. 9. TEXTURE: Soft microfiber provides a comfortable textured finish against your body. 10. PORTABLE: Easy to carry and unpack using the carry strap provided. 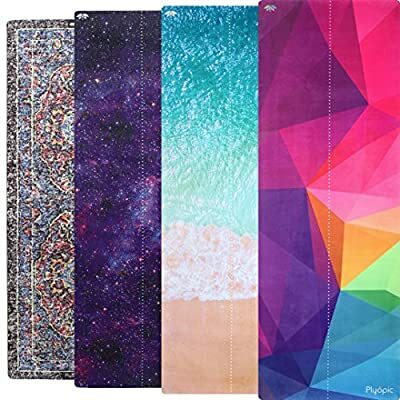 Just click "Add to Cart" at the top of the page to have your very own Plyopic All-In-One Mat rushed straight to your door. A perfect gift or present for a Yoga, Pilates or Fitness Enthusiast. Order today and join our tribe of satisfied customers who LOVE the Plyopic All-In-One difference. THE NEXT GENERATION OF YOGA MAT - Discover a new type of grip that gives you superior hold and transition in both dry and sweaty practice, free from the distractions of a yoga towel. PERFECT FOR YOGA, PILATES AND EXERCISE - Designed for all types of Yoga and Pilates: Hatha, Ashtanga, Vinyasa, Iyengar, Kundalini, Power, Bikram and Hot Yoga. Flip your mat over and use with footwear for gym or fitness exercises. DURABLE AND ECO-FRIENDLY - Built to last with SGS certified materials that are both biodegradable and kind to the environment. Choose a mat that's soft against your skin and better for your health. ENHANCED STABILITY AND SUPPORT - Improve your balance and stability in any pose with a dense rubber base that firmly grips the floor and delivers optimal cushioned joint support. LIMITED EDITION DESIGNS - Express yourself and be the envy of your classmates with one of our limited edition designs. Buy your unique design now. Once they're gone, they're gone!